We have manufactured Karm Fishpumps for 33 years. Today, our most sold fishing vessel product, are fishpumps. There are now 450 fishingvessels worldwide, using our pumps. The new generation Karm fishpumps have very good human consumption performances. This delivery can consist, hose reels, fishpumps, powerpack , fish hose and fish/water seperator. We deliver a wide range of equipment for handing the fishpump. 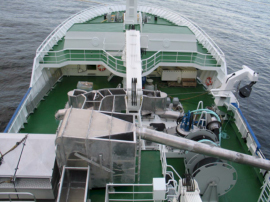 This include special adopted deck cranes , telescopic handling boom to integrated handling fishpumpframe. 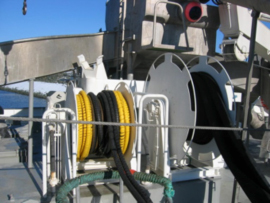 Our Fishpumphandling system consist of a combined fishpumpcrane and hosedrums. The fish pump can be operated by one person. We deliver a wide range of hose drums. 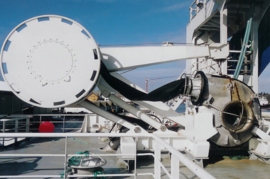 Both for handling fishpump hose and hydraulic oil supply hoses. We deliver different types of waterseperators for different waterflow and size of fish. 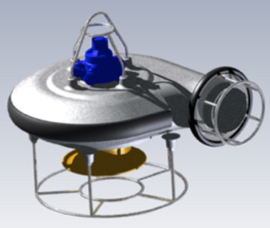 The system can consist of automatic valves to control flow to the different RSW tanks. We have designs for automatic sortingsystem combined with water seperator. Fishpump hose8", 12", 14", 16", 18" and 20" hose at store. Our unique hose connector range consist of hosecouplings, quick connectors, swivels, of Karm Fishpumps. We deliver different types of powerpacks . Eletric driven hydraulic powerpacks, diesel driven hydraulic powerpacks , PTO driven hydraulic powerpacks. The fishpumps is driven by highpressure hydraulic motors.